A library is one of the most important assets a community can have. 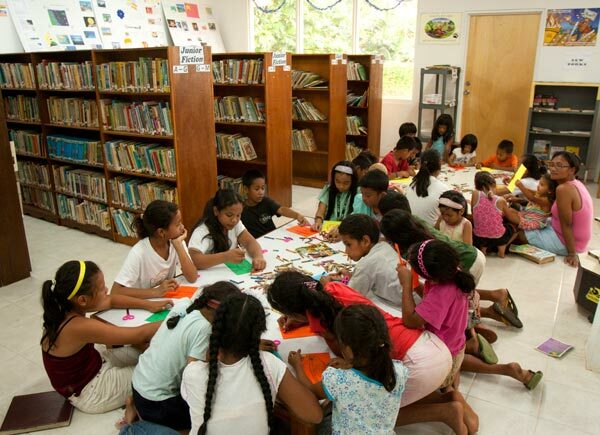 The people of Pohnpei have every right to be proud of the Library that serves them. Many individuals and organizations have dedicated their time and labor to the development of Pohnpei Public Library and helped to ensure that the facility is maintained and continues to improve in the future. One afternoon in the latter part of 1985, Christine Lebehn and Penny Weilbacher, two teachers in the English Department of the Community College of Micronesia, were discussing educational needs in Pohnpei. They agreed that there was a great need to establish a public library in Pohnpei. A public library would entice young people to read, and in doing so, better prepare them to compete academically with people other parts of the world. Chris and Penny began organizing, and soon more people joined in their effort. The Friends of the Pohnpei Public Library Organization was born in early May 1986, and the organization began long and difficult process to raise money and to gain support for their goal. Numerous fund-raising effort took place in these early days and the first books started to be collected. The major fund-raising activities from 1986 to 1989 focused on raising sufficient funds to construct a library building. Approximately $35,000 was raised from the following sources: the Miss Liberation Day Contest in 1986 ($17,000), appropriation from the FSM Congress in October 1986 ($10,000), the Gala Dinner-Dance in 1987 ($5,000), and the 1987 Calendar Project ($3,000). The Friends of Pohnpei Public Library petitioned then Pohnpei State Governor Resio Moses for assistance. Governor Moses was able to secure a donation of land for the library at its present location on the south side of Kolonia Town. Making use of the $35,000 raised by FPPL and with donations and/or discounts on materials from local businesses, the United States Civic Action Team (CAT) was able to begin construction. The Library building was completed soon after, and the official groundbreaking took place in April 1987. Pohnpei Public Library officially opened in February 1988 with more than 10,000 books in its collection. Although the library was founded by volunteers, it needed to have a trained staff in order to be sustainable. This was made possible when the Library building and its assets were handed over to the Pohnpei State Government, which agreed to provide annual funding for the Library's operations while the Friends of Pohnpei Public Library would retain control over the day-to-day operations of the Library. The first paid staff members began working at the Library in January 1989. As the years progressed, the Library continued to grow. The children's room--Wasahn Kamarain (Place of Enlightenment)--was opened in January 1995. The project came about with assistance from a group of volunteers from Tacoma, Washington, called Alliance for Cultural Exchange. The group spent three weeks in Pohnpei during the summer of 1994 working on an extension of the library roof to cover the new room. A local company was also contracted, and the project was completed in December 1994. Numerous individuals and organizations have contributed to the success and expansion of the Library. We would not be able to function without the generous support of both local and international contributors. We are eternally grateful for everything we have received. The University of Oregon (UO) donated the first computer in February 1995. Four years later, through the Australian Government Small Grant Scheme, five more computers were acquired for the cataloging of the library holdings. In 2000, the College of Micronesia - FSM, through a Title III Grant, assisted the Library in establishing Internet access. The FSM Library Service Sub Grant Program awarded the Library with three additional computers and covered Internet costs for a period of one year. In April 2002, the Library received seven computers from the Bill Gates Foundation. Improvements to the building in 2003 included an expansion of the computer lab, made possible through funding received from the USDA Rural Development Grant. The Library up-graded its Internet service with the addition of a T1 line in 2005. A technology Aus-Aid Grant in August of 2007 was used to purchase two more computers, one laptop, two printers, one back-up battery, one copy machine, and a projector. Three computers were donated by the Rotary Club of Guam in 2010, and the following year PPL received four computers equipped with Destiny Library Manager Software through the Aus-Aid Grant. In 2014, The Chinese Embassy donated 6 new computers to assist with number of patrons signing up everyday waiting to get the chance to use the computer lab. In addition, Congressman Ferny S. Perman provided a free Wi-Fi for our patrons to enable the students to do their research online and the people of Pohnpei to contact relatives and friends anytime. In 2001, the Library was awarded a grant from the Japanese Embassy to tile the main room of the building. The construction was completed by the Civil Action Team later that year. Tiling of the children's section and processing room and the addition of two restrooms for Library patrons and staff were made possible through funding received from the USDA Rural Development Grant. Donations of metal book shelves, books, and a few pieces of furniture from REPAC (Reach Out Pacific, Hawaii) in 2009 provided the Library with an internal facelift. The biggest improvements of all took place in 2011 within the renovation of the entire Library building by the U.S. Navy Pacific Partnership CCAD Team. Renovations were so extensive that the building was nearly rebuilt from scratch; roof, ceiling, walls, windows, restrooms, floors, the air-conditioning system, and the electrical wiring were completely overhauled. In 2016, MAHI International donated a playground equipment to the library. Australian Aid contributed $5,500.00 to assist with the cost of assembling and the Pohnpei Rotary Club contributed $2000.00 to assist with shipping cost. In September of 2017, a new camera was installed inside and iutside the library to help with the safety of the library and the patrons. The Bank of the FSM donated a "book-mobile" to provide library access to the public schools in remote communities around Pohnpei. In February 2002, the Pohnpei Visitors Bureau Board approved designation of a portion of land in the Pohnpei Botanical Garden for use by the Pohnpei Public Library as an Outside Reading Activities Center (ORAC). FPPL raised funds to build a local nahs (community hut), three swings, and three tables. Future plans for Pohnpei Public Library include the development of new programs to engage readers--both young and old--in more centralized reading activities; potential Movie Nights to connect reading with visual media; and an expansion of the Library building to accommodate more books and increased services.